The idea of the Flag Exchange Ceremony was conceived back in 1991 as a way to welcome home veterans of the Persian Gulf War. Over the years, the Flag Exchange has been revised and is now used as a symbolic passing on of a veteran’s legacy to a new generation. Last year, during the Delaware County Veterans Day Parade, hundreds of grandfathers, fathers, mothers, uncles, aunts, nieces, nephews, daughters, sons, granddaughters, grandsons, and friends participated in the ceremony. The veterans and recipients stood in front of the parade review stand. The veteran handed the recipient both an American Flag and a POW flag. The recipient accepted the gift and in some cases reciprocated with a note or flower. Most answered with hugs, handshakes, and more than a few tears. In passing on the flags, the veterans were figuratively passing on their legacy to a new generation. 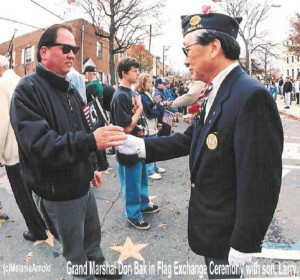 The Flag Exchange is a symbolic gesture, but serves as an important step in opening the dialogue between generations so that children and teens may learn and remember the important contributions that older generations have made through their service.